Excellent Quality made from Strong Polythene material. Strong Durable. Waterproof and can be wiped/cleaned. Strong elastic mouth . 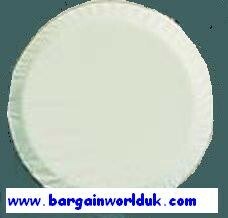 Made from strong White Background Polythene double stitch material?fully washable. For ALL 4x4 rear wheels, caravans, Motor Homes, Boats and VW Campers! WE HAVE THIS IN MANY SIZES XXS - FITS ALL TYRES WITH A DIAMETER OF 22-23 INCHES XSMALL - FITS ALL TYRES WITH A DIAMETER OF 24-25 INCHES SMALL - FITS ALL TYRES WITH A DIAMETER OF 26-27 INCHES MEDIUM - FITS ALL TYRES WITH A DIAMETER OF 28-29 INCHES LARGE - FITS ALL TYRES WITH A DIAMETER OF 30-31 INCHES Just tell us which size you want or alternatively tell us your tyre size for eg 205/70/15 and we will look this up in our chart and send you the exact correct size! Fits the following vehicles 4x4 Campervan Caravan Daihatsu Defender Discovery Ford Freelander Frontera Honda Hummer Isuzu Jeep Jimny Kia Lambretta Mercedes Mitsubishi Motorhome Nissan Pajero Pinin Rav 4 Scooter Shogun Suzuki Tata Terrano Van vw Vespa Wrangler and many more!